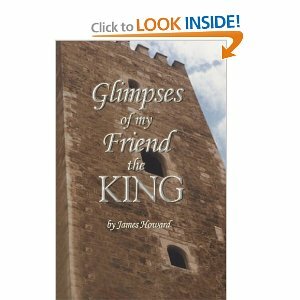 "Glimpses of My Friend the King" is a collection of eight short stories intended to show the depth of Jesus Christ's great love for people in a fresh and personal way. Set in a variety of locations, times, and situations, the person and character of Jesus Christ is revealed in each one to minister, to love, to protect, and to heal. The reader may discover a greater love an appreciation for Jesus Christ as well as a desire to know Him at a deeper level. It is intended for readers of all ages. Wow! This is a book that reaches right down to your soul and touches it. It consists of eight stories. Each story shows how Christ is there for us and how much he loves us. My favorite of all of them had to be the story "The Assassin". It is the story of a young boy with a father who is abusive. On his side is a Christian grandmother who prays for him daily. The story takes you through several stages of Stephen's life and shows you how the demons work to bring us down. It also shows how Christians in the world pray to keep the demons at bay. Intercessory prayer strengthens the angels to protect us. As Stephen struggled with needing to feel loved, the invitation of a young girl to attend church with her, and his grandmother's constant prayer for him I felt an urgency. I wanted to shout at him, "Don't leave without getting your life straight." You might not have until Saturday's church service. Do it know." I could not put the book down until I read the conclusion to the story. The book demonstrates how patient God is with us, his stubborn people. This is not a book to be read and put on the shelves but a book to be read and passed around. It seems that God brings certain books into my life when they are needed. This one came after I told a parent that I understood her Christian beliefs and wishes for a daughter and would modify an assignment. I was then chastised by administration for bringing my own religious beliefs into the situation. I was feeling the arrows of defeat hitting me. I see it is getting more and more difficult every day for a Christian to let others know about Christ. It is on those days that I feel God holding me closer. I will recommend this book to everyone I know.